Septic systmes rely on healthy bacteria in order for the system to operate efficiently thus preventing frequent pumping or the possiblity of a backup or leach line failure. 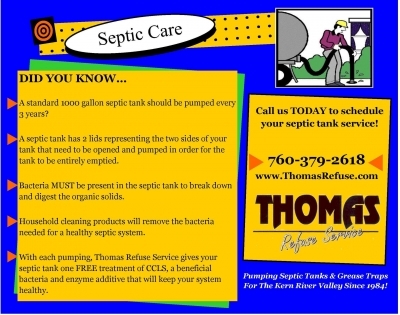 Every time you have your septic tak pumped by TRS, we will feed your tank with a FREE one quart dose of CCLS. We recommend monthly treatments of CCLS to maintain the needed healthy bacteria and keep your septic system functioning properly. We carry a number of different products to assist in the overall performance and maintenance of your septic system. All of our products may be purchsed in office or over the phone. Shipping is also available to our customers outside of the Kern River Valley. If you have questions regarding the products or pricing, please email us at info@ThomasRefuse.com or call us at 760-379-2618. Please download to view complete details regarding seperate hauling of sewage and grease.